Even though he faces a well-funded opponent, Andres' Ramos' campaign received a financial shot in the arm last week along with a critical endorsement. 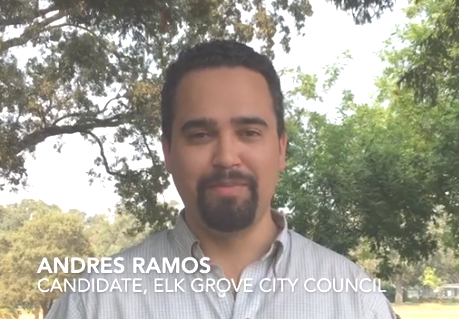 Ramos, who is challenging three-term incumbent Pat Hume for the District 2 seat of the Elk Grove City Council received a $1,000 donation from the Wellstone Progressive Democrats of Sacramento. This particular chapter within the local Democratic party is named after the late U.S. Senator Paul Wellstone of Minnesota who died in an airplane crash while campaigning for reelection in 2002. While Hume continues to maintain a substantial financial edge, Ramos also announced recent endorsements that could help his get-out-the-vote operation. Last week Ramos announced he received the support of the California School Employees Association. This labor endorsement followed last month's nod from the Sacramento Central Labor Council, AFL-CIO. Traditionally Sacramento-area union members have worked as precinct walkers for candidates they have endorsed in Elk Grove. "As someone who grew up in a working-class union household, I know the value of organized labor in lifting up working families," Ramos said of the AFL-CIO endorsement in a social media posting. "I am committed to being a voice for workers at City Hall." Along with the union support, Elk Grove Mayor Steve Ly has formed a slate of Democratic candidates including Ramos, who so far have been included on a glossy four-page campaign piece and a reusable grocery bag. Ly, who is engaged in a close three-way race against fellow Democrats Tracie Stafford and Elk Grove Vice Mayor Darren Suen, has made the five-candidate Democratic slate a centerpiece of his reelection strategy.